The proposed modifications to the US annual defense bill are intended to prevent US sanctions on India, which is planning to buy five S-400 Triumf air defense systems for around USD $4.5 billion from Russia. New Delhi (Sputnik) — A US congressional conference report suggests that India will likely be exempted from the Countering America's Adversaries Through Sanctions Act (CAATSA) in the final version of National Defense Authorization Act, 2019. 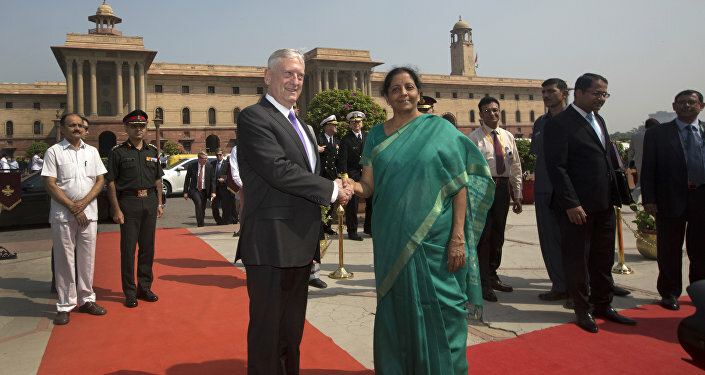 The development comes a week after Indian Defense Minister Nirmala Sitharaman claimed to have told a visiting US congressional delegation that CAATSA was a "US law, not UN law." "Provides a modified waiver to section 231 of the CAATSA that would require presidential certifications designed to protect US alliances, military operations, and sensitive technology; encourage allies and partners to reduce inventory of Russian-produced major defense equipment and advanced conventional weapons; and exclude the possibility of waivers for Russian intelligence agencies and other entities engaged in cyber attacks," a media release issued by the US Senate Armed Services Committee reads. Now the conference report will go to the two chambers of the US Congress for approval. The report is most likely to be passed without a glitch, as it has the support of both the governing Republican Party and the opposition Democratic Party. CAATSA covers 39 Russian defense entities, most of which have crucial buyer-supplier relations with India, and any transactions with these entities are liable to punitive measures under the act. This law has posed a major impediment to India's planned procurement of the S-400 air defense system from Russia. The deal is stuck at the final stage after more than two years of negotiations. "India and Russia have had close ties for defense supplies for many decades. This umbilical cord cannot be snapped. Discussions for S-400 have been going on for long. The USA has been conscious of this Indian sensitivity. In furthering long-term strategic relations between the two, it is a sensible decision to make this important exception," Air Marshal Anil Chopra (retired), a defense analyst, told Sputnik. Another analyst is of the opinion that India gives utmost priority to its own interests rather than mercurial US policies. "India made it clear that it is in its own interest that it has decided on the S-400 system. Its interests are primary and overall. Besides it does not accord primacy to mercurial US policies from time to time," Mohan Guruswamy, a strategic analyst, opined.